We are very proud of our newest high quality Vitamin C 20% Serum because of its exceptional results and competitive price compared to other products on the market. Our quality is in a class of its own especially because we don't have any useless fillers or harmful chemicals! Other companies won't put a proper amount of the advertised ingredients for it to work properly, which forces you to buy more for barely noticeable results!The quality of our High Potency Vitamin C(L-Ascorbic Acid) 20% serum with Pure Hyaluronic Acid speaks for itself!We are so sure that you are going to LOVE our product that we offer a money-back guarantee! Satisfaction guaranteed or your money back! Contact us for more information! We try to answer all questions within 12 hours to provide you with the best customer service!Get younger LOOKING and FEELING skin in less time than it takes for you to get ready in the morning! JJ Labs' highly concentrated formulas ensure that you will see noticeable results in as little as 5 minutes! All of our ingredients are completely natural and extremely beneficial for your skin! Try it now and join the hundreds of users that have benefitted from our products! Satisfaction guaranteed or your money back! Contact us for more information.We make all of our products right after they are placed so as to provide you with the FRESHEST and best quality serums!Perfect for giving out as a gift! Our freshly made serums are packaged in a special black velvet case that's great for everyone! The elegant packaging helps giving our amazing serums perfect for any occasion, including birthdays, holidays, and those special "just because" days. People love how our serums make their skin feel and look years younger, especially with our low prices! We are now offering the option to change your dropper to a pump dispenser or a pump dispenser to a dropper! If no request is noted, we will provide the standard dispenser for the ordered serum. 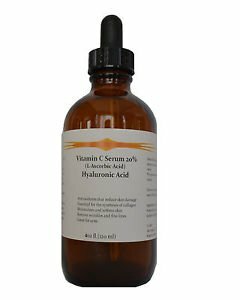 High Potency Vitamin C (L-Ascorbic Acid) 20% with Pure Hyaluronic Acid Anti Aging Serum4 oz. OUR BEST SELLER!Read some ACTUAL testimony from real customers! "I was hesitant to try another serum but saw this on Dr. Oz so took a chance. Dark spots have faded noticeably in just a few weeks use. No side effects that I can tell. "- Elaine, Sept.6,2013"I use this product regularly and see results. I would highly recommend this product to anyone who wants smooth skin." - Penquin, Sept. 2,2013"Saw this on Dr. Oz show and decided to try it out. So far I believe it is working. It certainly seems like it is tightening your skin. It was noted that it might be a few months until you can be sure but in just three weeks I believe there is a difference. I'll continue till its gone and make my full assessment than." - Ruby, Sept 4,2013"Another fast delivery of these top notch products at incredible prices. I love the purity, all of the wrinkles with no extra chemicals. Itmade my skin a lot firmer after a couple of uses and it felt great on my face!" -Diana 53years old, CA"Nice and thick consistency! Helped my skin a lot. I love this serum! It's very gentle and absorbs without a trace. I already see benefits. Package arrived quickly. Thank you. The price was the lowest I've found online. Will be buying another bottle from this store." Evan 59 years old, NY"Fast shipping and packaged very well. A little goes a long way with this serum. I've been using it faithfully. Feels really nice on. THE REAL DEAL! Keep them coming!" Riley 44 years old, CA"100% I'm very satisfied with this product. The best way to apply is after cleansing and scrubbing your face with your favorite scrub. Then apply the vitamin c. You will feel the quench and tightening right away! I will be a repeat customer." Melanie 44 years old, CACustomers love our fast shipping and great product for an affordable price! Check out our store for a serum that's perfect for you! "No thickening agency! Highest solid percentage of Hyaluronic acid in the market! "We carry five different strengths for different skin types:High Potency Vitamin C 10%- For sensitive skinHigh Potency Vitamin C 15%- For dry skinHigh Potency Vitamin C 20%- For all skin typesHigh Potency Vitamin C 25%- For oily or mature skin or skin with clogged poresHigh Potency Vitamin C ph4.5-For Sensitive Skin Type(those who too sensitive for ph3.5)Several studies have highly recommended applying vitamin C onto the face daily to protect against UV-induced cell damage. This sun damage not only causes premature aging, but also many forms of skin cancer. Vitamin C has many other beneficial properties, including being one of the few ingredients that has a scientific base to show that it reverses signs of aging for your skin.Vitamin C (L-Ascorbic acid) has been shown to stimulate collagen, decrease wrinkle depth, and have lightening effects on pigmentation.Vitamin C is a powerful and effective antioxidant that protects our bodies from free radicals that cause oxidative stress. Excessive oxidative stress, or "cellular rust," can lead to many severe medical conditions and is associated with many different types of cancer, including lung, mouth, throat, colon, stomach and esophagus. Vitamin C also helps to regenerate vitamin E (another useful antioxidant).Vitamin C is used in skin care as a strong antioxidant, especially in regard to protecting the skin from sun damage. It strengthens the skin barrier and thickens the dermis. It can expedite the healing of wounds and reduce inflammation. In high concentrations, it can reduce the appearance of skin discoloration. Most important, it promotes collagen production, which subsequently plumps the skin and lends it radiance and smoothness. Dermatologists often use vitamin-C products to enhance the effects of cosmetic treatments, such as microdermabrasion and chemical peels.Vitamin C is a prime ingredient of collagen, the substance that binds cells together. Collagen metabolism and production is are key attributes of healthy, radiant, younger looking skin. Collagen ingredients and ingredients that promote collagen production are widely used and advertised in body and skin care products. Collagen, in fact, depends on vitamin C, which implies the vitamin's importance to healthy, attractive skin. Stable collagen production fights wrinkles, and ensures evenness in the skin's tone and texture.Vitamin C's function as an antioxidant also benefits the skin, as it is able to protect the skin from damaging free radicals.Benefits of Vitamin C(L-Ascorbic Acid)-Brighten and smooth complexion:-Vitamin C helps to stimulate skin’s own rate of natural exfoliation for a radiant look and feel.-Protect skin cells: Vitamin C is an antioxidant that can help reduce skin damage caused by factors like sun exposure, pollutants, and cigarette smoke.-Promote collagen production: Vitamin C is proven to stimulate the synthesis of collagen, a structural protein of the skin. While young skin is full of Vitamin C, aging skin naturally loses this nutrient over time, making lines and wrinkles more prominent.HYALURONIC ACIDHyaluronic acid, also known as HA, is a natural compound found in skin that has many important functions, including holding in moisture,providing cushioning, aiding in tissue repair, holding together the skin structural components collagen and elastin, and helping create a protective barrier against microorganisms.Many skin care products contain hyaluronic acid. Topical products containing HA are effective at moisturizing skin cells, which prevents water loss and protects the skin from dirt and other pollutants.MoisturizingSince hyaluronic acid holds moisture well--holding up to 1,000 times its weight in water--it is commonly used in moisturizers. It serves to deliver AND hold water to the skin. As a large molecule, it doesn't permeate deep into the skin and stays near the surface to moisturize the skin's surface layers.WrinklesThe loss of natural hyaluronic acid is one of the most common causes of wrinkles, so the idea of putting HA back into the skin to repair wrinkles makes sense. Hyaluronic acid fillers, like ourHigh Potency Vitamin C (L-Ascorbic Acid) 20% with Pure Hyaluronic Acid Anti Aging Serumare useful for reducing or removing wrinkles.We keep our hyaluronic acid PURE and ALL NATURAL to make your skin look younger, smoother, and firm.SafetyHyaluronic acid based products are considered extremely safe. There are few allergic reactions or side effects involved with using hyaluronic acid, though some people may experience a mild, temporary redness or swelling after an injection.We keep our product for topical use only so as to reduce the chances of this!ConsiderationsRepeated use of hyaluronic acid will maintain moisture levels in the skin, preventing skin dehydration.Directions: Use twice daily, once in the morning before your normal moisturizing and sunscreen routine, and again in the evening to a cleansed face. Gently massage face with upward motions until serum has completely been absorbed by skin. Our serums are very concentrated and only a small amount needs to be applied in order to be effective. Keep away from direct sunlight and store it in a cool environment, such as a refrigerator, to further extend your serum’s longevity. This also gives you a cool, refreshing feeling when you apply it!Ingredients: L-Ascorbic acid(Vitamin C), Pure Hyaluronic Acid, Optiphen, Potassium Sorbate, Citric Acid, Distilled WaterShips same or next business day!